VA's Monitoring and Control System (M&C System) is the complete control instrument for the control and monitoring of satellite earth stations. Based on the use of standard networks (LAN) the client-server structure enables a mobile operation independent from the location. Graphical interfaces ensure a user-friendly handling. Furthermore, one or more ComServers allow to control and monitor any number of antennas, with the server assigning an independent antenna software module to every antenna. The server(s) is/are connected to the basic analyzing units by means of RS 232, RS 485 or GPIB interfaces. The clients which communicate with the servers through a LAN have options to access every antenna module, thus leading in turn to the result that every antenna can be controlled and monitored through each client. The administrator can implement any access rights and operating options by a defined in hierarchical levels. The modular structure of the software allows its customer-specific supplementing and enhancement. Adoptions to future analyses and tasks can be realised on an individual basis. The use of standardized hardware and software components ensures easy installation and control. The compliance with high requirements on interference immunity, reliability, access safety, very short access times, protected data transmission and special functions in the field of signal processing is ensured. 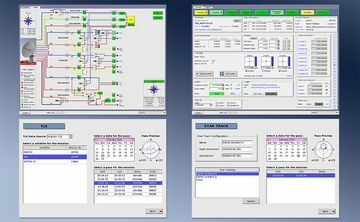 More-over, the M&C system provides the customer with the option to introduce project-related functions himself. All functions are provided by a customized GUI on a high resolution PCAP touch screen and via different remote interfaces.